Dance Theatre of Ireland have announced that they are are set to expand their hugely successful, evidence-based modern dance programme Well-Dance for Seniors to Mount Merrion, as well as other locations. Well-Dance for Seniors is an extremely popular programme for seniors providing a modern dance class that will guide people through a series of simple, modern and creative dance movements and exercises to improve breathing, balance, fluidity, flexibility and strength – all to a great range of music, for example: Stevie Wonder’s Superstition, Gene Kelly’s Singing in the Rain, Elvis, Frank Sinatra, Eva Cassidy, Johnny Cash and more). These classes set you up for the day, are exceptional fun and give fantastic results. Some movement is done involving partnering (a la ballroom) but most movements are modern, and include learning short phrases to great music. The Class also includes dancing, moving and not having to remember a thing – through improvisation! The class is designed and taught by the Dance Theatre of Ireland Artistic Directors Robert Connor and Loretta Yurick, one of Ireland’s leading professional Dance Companies. 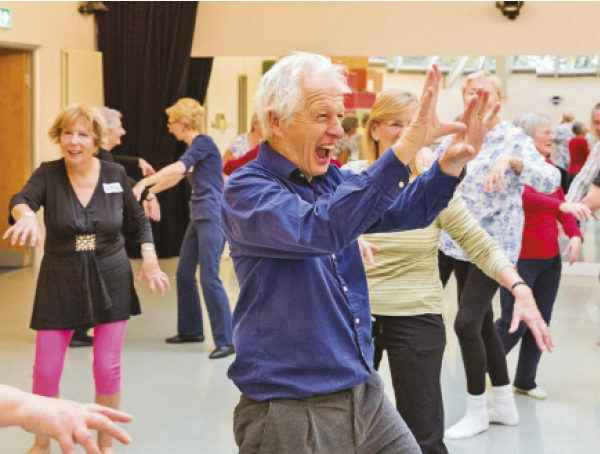 The Well-Dance programme in Ireland has been studied and documented in two recent Studies, in 2014 and 2015, by Dr. Deirdre Connelly, Trinity College Occupational Therapy, Physical and Occupational Therapy in Geriatrics “as improving mobility, confidence, balance and well-being.” The study also found that dance promotes emotional wellbeing and combats isolation. Well-Dance for Seniors – Dun Laoghaire Tues and Wed mornings 11-12:30. DTI Centre for Dance – Bloomfields, Lower Georges St. Dun Laoghaire. Well-Dance in Kilbarrack – Mondays 1-2.15pm, Foxfield-Kilbarrack Parish Hall. Well-Dance in Ballinteer – Wednesdays 4.15-5.15pm, Ballinteer Community School. Well-Dance in Mount Merrion – Fridays 3.30-4.30pm, Mount Merrion Community Centre. Well-Dance in Shankill, Wednesdays 1:45-3pm, Shankill Tennis club.